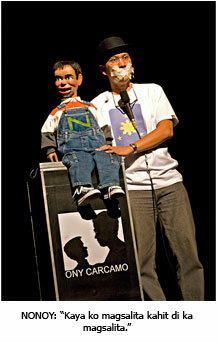 Ony Carcamo does a number of ventriloquism tricks in his shows--such as the Drinking Bit (he drinks while his vent partner sings) and the Talking Glass (an empty glass produces voices). But his most mystifying trick, his favorite--and his audience's--show closer is the Tape Over Mouth act. After a few minutes of dialogues (let's not mention the whole routine here), Ony and Nonoy invite an audience member on stage. Nonoy instructs the volunteer to PUT SEVERAL STRIPS OF MASKING TAPE over Ony's mouth, so Ony--and Nonoy, of course--can't talk... But a miracle happens! NONOY CONTINUES TO TALK... AND TALK... AND TALK! Ony uses NO STOOGE, NO VOCAL RECORDINGS, NO TRICK VOICES, NO SPECIAL TAPE, NO GIMMICKS! Even with the tapes over his mouth, ONY STILL GIVES NONOY HIS VOICE--LIVE! This is something you need to see to believe! You can request Ony to make this amazing ventriloquial trick his finale in his show for you. Here's a magical, jaw-dropping routine that only Ony--and just a handful of ventriloquists in the world--can perform! "Very good, Ony. APPLAUSE! APPLAUSE!" "Wow! How the heck do you do that?"